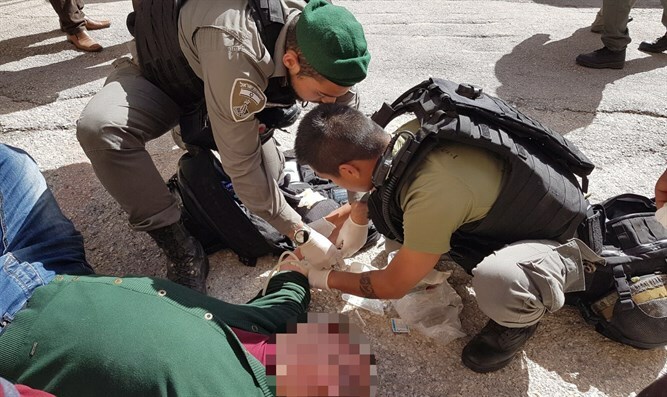 Border Police paramedic administers first aid to Palestinian Authority Arab who lost consciousness near Hevron’s Cave of the Patriarchs. A Palestinian Authority Arab fell unconscious in Hevron while exiting a checkpoint near the Cave of the Patriarchs (Me’arat Hamachpelah). Border Police officers called the troop paramedic, who administered first aid to the PA Arab and helped him regain consciousness. Red Crescent paramedics arriving later on transferred the man, a resident of Hevron, to a local hospital. In December, a similar incident occurred, in which Border Police officers saved a PA manwho had lost consciousness and stopped breathing. In July 2017, a PA father from Hevron approached Israel Border Police officers asking them to help his son, who had fallen in the family’s home and suffered an injury to his head. The officers immediately called over their unit’s paramedic, who administered first aid. Afterwards, the Red Crescent arrived to take the boy to a local hospital. Palestinian Arabs see their local Israeli security forces as a place to go whenever there is a problem or need, despite the complexity of the security situation.